WELCOME! ~ PLEASE RING 01257 252364 FOR RESERVATIONS. WE ARE ALSO ON SOCIAL MEDIA ~ CHECK FOR US ON FACEBOOK, TWITTER & INSTAGRAM. The High Moor Restaurant is situated in the lush Lancashire countryside town of Wrightington, Wigan, with an enviable reputation for superb food, outstanding wines and genuine hospitality, offering olde world style dining. A Lancashire Life ‘Restaurant of the Year’ The High Moor has awards and nominations for the quality and value of its wines and foods with a Visit England Taste Accreditation achieving the Highest Quality Assured rating. 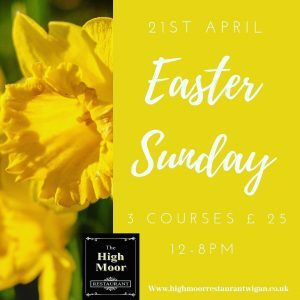 Whether you want a set menu, a leisurely a-la-carte meal or a traditional Sunday lunch you will find it at The High Moor. We are proud to be an old fashioned restaurant in design but new and modern in our dishes and menus. From our picturesque location here in Wrightington, Wigan, the views stretch out over open, un-spoilt countryside. Large windows, beamed ceilings and inglenook fireplaces create an atmosphere that is warm and welcoming. Originally a Coaching Inn, The High Moor has been welcoming travellers since 1642 and with the aid of sympathetic renovations, has retained its character and style. We can cater for parties large or small and we can help make that special occasion extra special, ask for details. The restaurant is also available for private bookings and can accommodate up to 80 people. We have ample parking and are easily reached from the main routes, including the M6. Just give us a call and we will be delighted to help you plan. This area is rich and fertile and we make the most of fresh, local produce in our dishes, wherever possible. Our kitchen team continually create menus to satisfy all tastes, with something for everyone. There is a choice of fixed price menus or À-la-Carte, as well as special menus of the season and our wine list is the perfect partner with a broad range of choices from some of the finest growers. We have regular special events and theme nights, so do check this site often to find out what is going on when you are planning to visit – or give us a call. Christmas and New Year are magical here, with the cosy, relaxed atmosphere, crackling fires and scents of winter in the countryside, so we do recommend booking early if you are planning to visit during the festive season. Throughout the year though, from the delights of spring blossoms and flower baskets, to warm summer evenings and colourful autumn, The High Moor Restaurant is always at its best. We like to think of your visit as an ‘occasion’ and hope you will too; if however, you are looking for a more casual and impromptu experience with a pub/bistro atmosphere, our sister establishment, The Rigbye Arms Country Inn & Restaurant, is located just 500 yards away. They offer a varied menu and an extensive specials board.